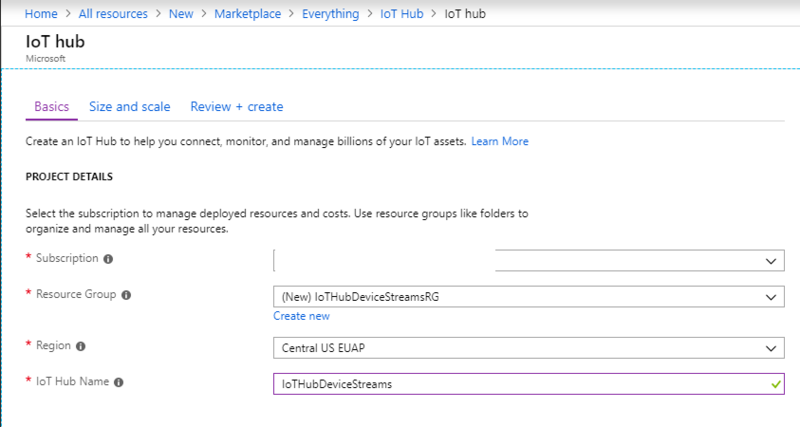 Microsoft Azure IoT Hub currently supports device streams as a preview feature. IoT Hub device streams allow service and device applications to communicate in a secure and firewall-friendly manner. This quickstart guide describes execution of a Node.js proxy application running on the service side to enable SSH and RDP traffic to be sent to the device over a device stream. See here for an overview of the setup. During public preview, Node.js SDK only supports device streams on the service side. As a result, this quickstart guide only covers instructions to run the service-local proxy. You should run an accompanying device-local proxy which is available in C quickstart or C# quickstart guides. We first describe the setup for SSH (using port 22). We then describe how to modify the setup for RDP (which uses port 3389). Since device streams are application and protocol agnostic, the same sample can be modified to accommodate other types of client/server application traffic (usually by modifying the communication port). To run the service-local application in this quickstart you need Node.js v4.x.x or later on your development machine. You can download Node.js for multiple platforms from nodejs.org. If you haven't already done so, download the sample Node.js project from https://github.com/Azure-Samples/azure-iot-samples-node/archive/streams-preview.zip and extract the ZIP archive. Region: This is the region in which you want your hub to be located. Select a region that supports the IoT Hub device streams preview, either Central US or Central US EUAP. Pricing and scale tier: Ensure you select one of the standard (S1, S2, S3) or the Free (F1) tier. This choice can also be guided by the size of your fleet and the non-streaming workloads you expect in your hub (e.g., telemetry messages). For example, the free tier is intended for testing and evaluation. It allows 500 devices to be connected to the IoT hub and up to 8,000 messages per day. 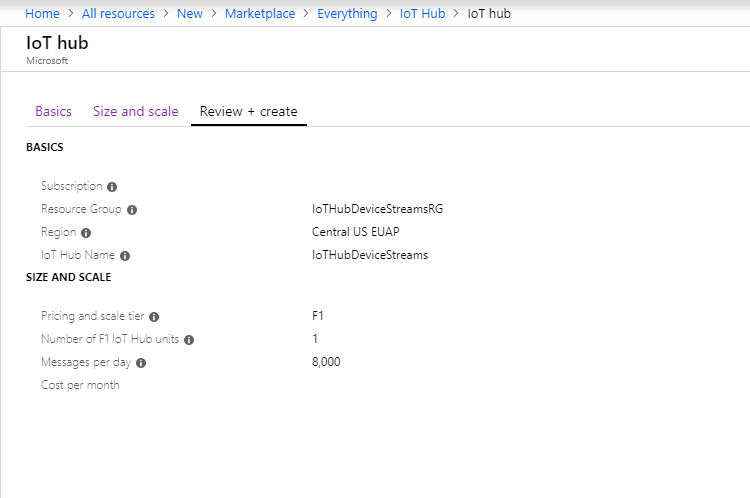 Each Azure subscription can create one IoT Hub in the free tier. 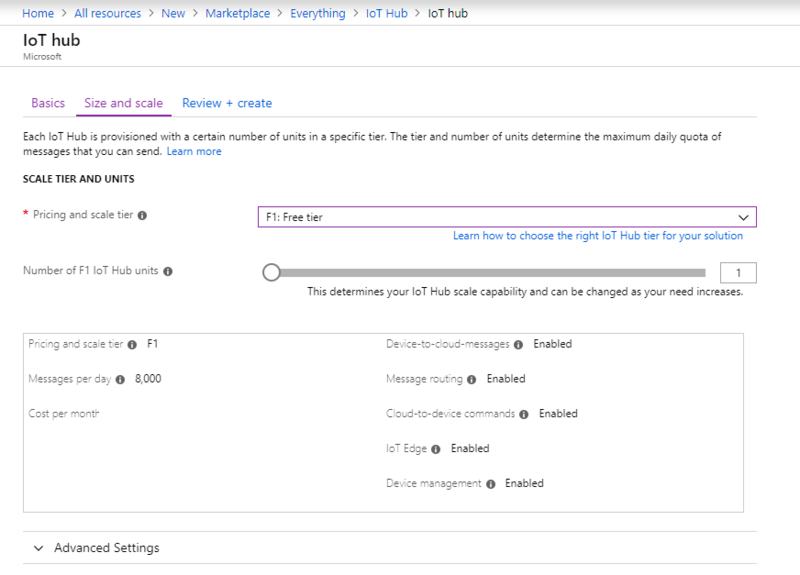 IoT Hub units: This choice depends on non-streaming workload you expect in your hub - you can select 1 for now. MyDevice: This is the name given for the registered device. Use MyDevice as shown. If you choose a different name for your device, you will also need to use that name throughout this article, and update the device name in the sample applications before you run them. As mentioned earlier, IoT Hub Node.js SDK only supports device streams on the service side. For device-local application, use the accompanying device proxy programs available in C quickstart or C# quickstart guides. Ensure the device-local proxy is running before proceeding to the next step. Assuming that the device-local proxy is running, follow the steps below to run the service-local proxy written in Node.js. Provide your service credentials, the target device ID where SSH daemon runs, and the port number for the proxy running on the device as environment variables. Change the values above to match your device ID and connection string. Navigate to Quickstarts/device-streams-service in your unzipped project folder and run the service-local proxy. In Linux, run SSH using ssh $USER@localhost -p 2222 on a terminal. 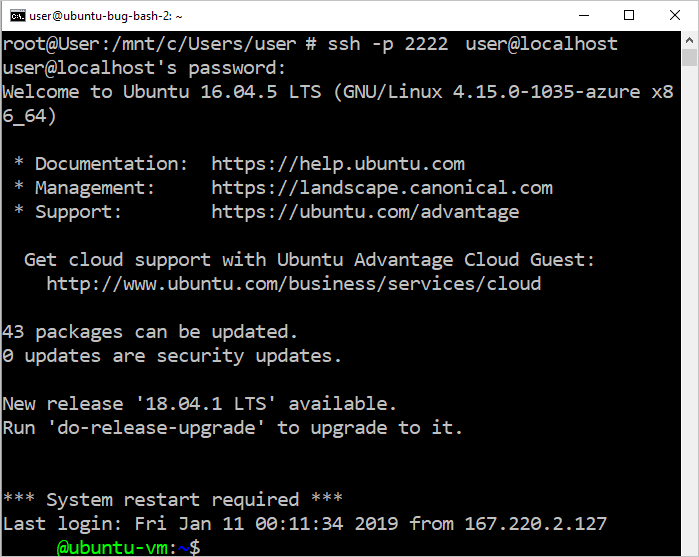 In Windows, use your favorite SSH client (e.g., PuTTY). 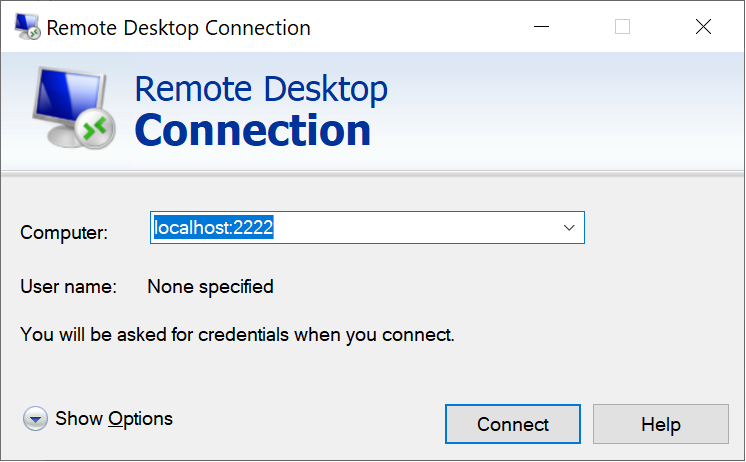 Now use your RDP client program and connect to service proxy on port 2222 (this was an arbitrary available port you chose earlier). Ensure that your device proxy is configured correctly for RDP and configured with RDP port 3389. In this quickstart, you have set up an IoT hub, registered a device, and deployed a service proxy program to enable RDP and SSH to an IoT device. The RDP and SSH traffic will be tunneled through a device stream through IoT Hub. This eliminates the need for direct connectivity to the device.